He moved to The Netherlands in 1978.In Utrecht Sebastián learned the profession of harpsichord maker with Willem Kroesbergen next to whom he worked during 6 years. At the same time he dedicated to the research and construction of historic plucked musical instruments (Lutes, vihuelas, early guitars, etc.) Also he specialized in the restoration and conservation of antiques and of romantic guitars. With a group of musicians and musicologists he founded the Dutch Lute Society with the purpose of promote this instrument and its music. During four years he was a member of the directorate of this society. He has given several conferences and seminars for different organizations like: Vereniging Huismuziek, Festival Oudemuziek Utrecht, Koninklijk Conservatorium Den Haag, Sweelinck Conservatorium Amsterdam, Nederlandse Luitvereniging, Belgische Luitvereniging, Archaeology Symposium Almere, Guitar and Cittern Symposium Michaelstein 2001, Musical Archaeology Symposium Michaelstein 2002, Instituto Cervantes Utrecht, Pro Música de Rosario (Argentina), Several Lectures in Buenos Aires (Argentina), Early Music Festival Utrecht 2008, Sociedad de la Vihuela 2008, etc. He was also member of SOMLA (Latin America Music Foundation) There, he organized a project on the reconstruction of the XVIII c. Jesuit violins from Bolivia. 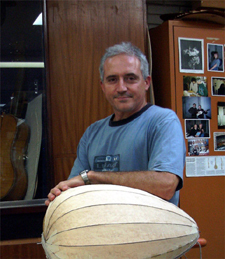 The last years he has given lute making seminars in Argentina to give over his knowledge of 34 year of experience with historic musical instruments.